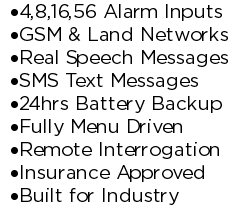 The M30 Auto Dialler can now send SMS Alarm Messages instead of or as well as Real Speech Messages. The upgrade is available to be supplied with a new Auto Dialler or as a retro upgrade to a currently installed machine. This is ideal for people who want a visible alarm message instead of an audible message or for logging alarms. But you need to bare in mind that SMS messages are not a guaranteed service i.e. the message might arrive instantly, in 5 minutes or 5 hours. Also if your phone is out of reception when the SMS message is sent very often there is an extended delay for delivery. The M30 Autodialler '0' key cancellation software upgrade provides the following additional feature to the standard M30.